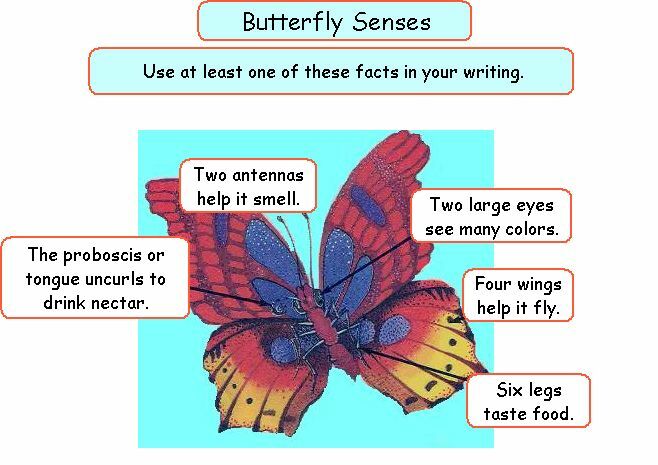 Each spring, my class studies butterfly metamorphosis. Students look forward to learning more about how caterpillars "change" into butterflies. This year, we began our study months ago when we learned about animals and insects. We knew that insects have six legs and some can fly. But we wondered about what really happens inside the butterfly chrysalis. Was the caterpillar changing or switching body parts to look like a butterfly? After reading several books and viewing some interesting videos and websites about butterflies, our larvae arrived by mail around Memorial Day. We kept a log to record their growth and how they seemed to change. We measured the caterpillars with a centimeter ruler. Two of them never got to the top of the jar before the chrysalis started to show. We wondered if they would be able to complete the metamorphosis without hanging. They made it just fine! All 5 of our larvae became pretty butterflies! This is a picture of the first two to emerge. We loved watching them fly away when we opened the cage outside. One butterfly landed on Bridget's sleeve for a little while! Most of my students chose to make a model with paper scraps. All of the students inserted their scanned illustration into a Power Point slide. We used MaxShow from Scholastic Keys and added a title using Word Art. Some students also made illustrations in PAINT and added those images to their slides too. The teacher typed in story text (we were in a rush to finish before school ended!). MaxShow has a talking interface that reads the text on a page. This was helpful for students who needed this extra support while reading their classmates� pages. Others turned it on just because they thought it was fun to watch a parrot read the pages! Take a look at some of our PowerPoint slides. Their finished writing also was printed and displayed in the hallway to share with our school community. 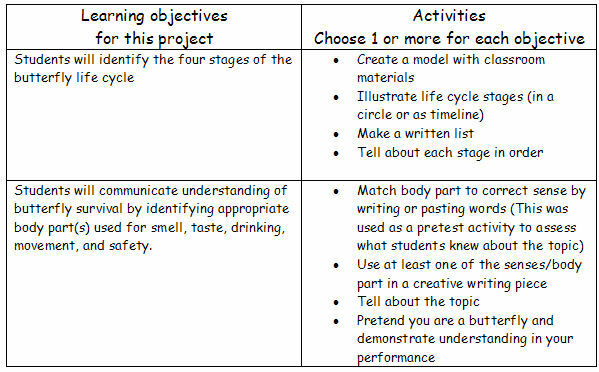 A final assessment was done with each student using a Kidspiration template. Once again, the talking interface was available. This is a very simple drag and drop activity that shows how alternative assessment can be done on the computer. I�m excited to utilize this kind of assessment with other topics throughout our curriculum. Click HERE to download this Kidspiration file. This website had the answer to our question: How does a caterpillar turn into a butterfly? This is not easy to explain. One could say that inside the chrysalis the caterpillar changes clothes and turns into a butterfly. Actually, what happens is that the caterpillar structures are broken down chemically and the adult�s new structures are formed. To be more blunt, the solids of the caterpillar completely liquify and then form the new solid structures of the butterfly.